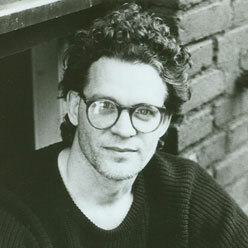 Charlie Smith is the author of six collections of poetry which include Women of America (W. W. Norton, 2004), Heroin and Other Poems (W. W. Norton, 2000) and six novels including Cheap Ticket to Heaven (Henry Holt & Co., 1996). Smith, born June 27, 1947 in Moultrie, Georgia, and educated at Phillips Exeter Academy, Duke University, and University of Iowa Writers Workshop has worked as a journalist and editor, businessman, farmer and laborer. Smith worked for the Peace Corps in Micronesia from 1968 to 1970. Residing in New York City, Smith now devotes his time to writing and teaching. “The haunting tone of Smith’s verse reflects a cynical and disillusioned world whose inhabitants desperately seek a hard won wisdom that is central to Smith’s own experience.” –Gary Kerley. Charlie Smith's poem "A Selection Process" is captured in this elegant, limited-edition broadside from Wood Works Press. Promotional poster from Rafael Campo and Evan Adams salon on Thursday, July 13, 2006. Only 12 autographed posters available. With exuberance, cunningness, and wisdom, Charlie Smith’s surprising poems explore love as a sinewy thing, resilient, capacious, able to endure gravel, glister, and tenderness, offering both sustenance and refuge. These poems are an affecting meditation on the mysteries of what drives the heart.